The residential building to the right is located at the rich neighborhood of Morumbi. 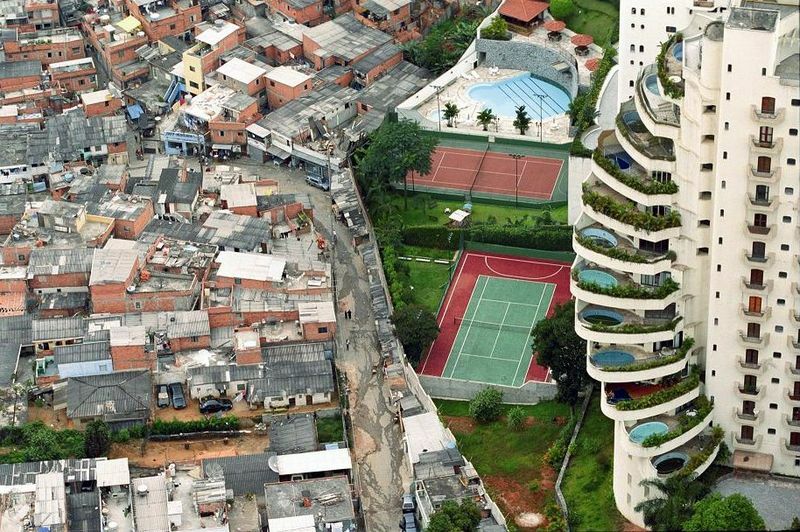 The precarious habitations to the left are part of Paraisópolis, one of the largest slums in the city. Brazil ranks 49.3 in the Gini coefficient index, with the richest 10% of Brazilians receiving 42.7% of the nation’s income, while the poorest 10% receive less than 1.2%. Terre’Blanche, who had lived in relative obscurity since the collapse of his organisation, was murdered in his sleep on his farm Villana just outside of Ventersdorp on April 3, 2010. He was reportedly beaten to death with pipes and pangas (machetes) by two black men, one of them a minor, allegedly over “a wage dispute”. Terre’Blanche’s body was found on the bed with facial and head injuries. Zuma accused Britons of considering themselves to be culturally superior owing to their past colonial activities. “When the British came to our country they said everything we did was barbaric, was wrong, inferior in whatever way. Bear in mind that I’m a freedom fighter and I fought to free myself, also for my culture to be respected. And I don’t know why they are continuing thinking that their culture is more superior than others, those who might have said so,” stated Zuma in an African newspaper. The President’s comments were published in a local private newspaper. Zuma, who has three current wives, made these comments after arriving in Britain with Thobeka Madiba, 38, his third wife. The Queen will welcome them at the Horse Guards Parade and take them to Buckingham Palace thereafter. A state banquet will also be held in his honor at the palace, where he is set to spend two nights. Zuma, a member of the Zulu tribe, was compelled to make a public apology following a love child with the daughter of a friend. This incident triggered the articles in Daily Mail and Daily Mirror which attacked Zuma. Zuma, whose state trip includes meetings with Gordon Brown, David Cameron and Nick Clegg, as well as a speech to members of parliament, plans to continue with the visit. This was confirmed by officials today. Vincent Magwenya, Zuma’s spokesman said the incident would have no impact in Zuma’s trip. Magwenya stated: “Mr Zuma is in the UK for wide-ranging programme of substantial and serious issues. The comments he made were not aimed at the British public in general but at certain sections of the media which have lambasted him for what he considers to be his culture. 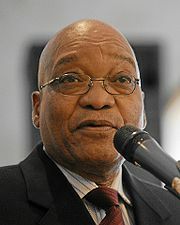 Mr Zuma had a meeting with British journalists yesterday and was asked not one question about his private life”. He also added that Zuma did not “appreciate reading things which he considers are patronising to his culture” and claimed that it was obvious that “his comments will have no bearing on the state visit.” The President, according to Magwneya, looks forward to the visit and will continue with the full schedule. Meanwhile, the Democratic Alliance, South Africa’s principal opposition party, stated that the reports in the British newspapers did not warrant Zuma’s lashing out at Britain. The youth sector of the African National Congress supported the President. It expressed its disgust at the British reports. “British media seem to have developed a habit of rubbishing our president and constantly portray him as barbaric and of inferior belonging,” the youth league said. “It is quite apparent that the British media is the one that is characterised and defined by the worst form of barbarism, backwardness and racism. These British racists continue to live in a dreamland and sadly believe that Africans are still their colonial subjects, with no values and principles. 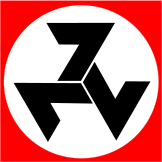 They believe that the only acceptable values and principles in the world are British values of whiteness and subjugation of Africans,” stated the party. Steve Biko after arrested at a police roadblock and suffered a major head injury while in police custody. Then police loaded him in the back of a Land Rover, naked, and began the 1,500 km drive to Pretoria to take him to a prison with hospital facilities in order to treat the already near-dead Biko. He died shortly after arrival at the Pretoria prison, on 12 September. The police claimed his death was the result of an extended hunger strike. Dimitri Tsafendas (14 January 1918 – 7 October 1999) assassinated South African Prime Minister Hendrik Verwoerd. Tsafendas, working as a parliamentary messenger, stabbed Verwoerd with a dagger during a parliamentary session. Tsafendas, at his trial, was found not guilty of murder by reason of insanity. He suffered from schizophrenia and claimed that he had a giant tapeworm inside him, which spoke to him. The court ordered that he be detained “at the pleasure of the State President”, which meant that only the South African State President had the authority to release him. He was never released. Nelson Mandela has officially been taken off the US list of terrorists by the United States government. This comes after a statement by Condoleezza Rice, the US Secretary of State, who said that it was a “rather embarrassing matter that I still have to waive in … the great leader Nelson Mandela,” back in April. The ruling, which also applied to all members of the African National Congress means that Mandela can travel to the United States without being approved by the Secretary of State. Nelson Mandela has recently been in the media due to his upcoming 90th birthday. As part of the celebrations, a concert was held in Hyde Park, attended by many influential politicians, including Bill Clinton, former US president. Nelson Mandela was a campaigner against apartheid who served one term as president of South Africa. Last week the government of North Korea was removed from the list of State Sponsors of Terrorism. This announcement was made as a reward to North Korea for turning over all documents related to its controversial nuclear program. Pyongyang turned over to China documents related to its plutonium core and waste activities.